**** Chosen by Winner: Dan S.
GNS = Go No Show. Nothing fancy, all GO! This nine inch overall flat ground bush knife really likes to work. The Flat grind ensures no drag when cutting. Micarta scale material is mechanically and chemically attached to the full tang handle. Large fish eye bolts and a large lanyard hole complement the tapered and contoured hand grip. It'll get the job done for you no matter what the circumstances. L.T. Wright has always been interested in knives. 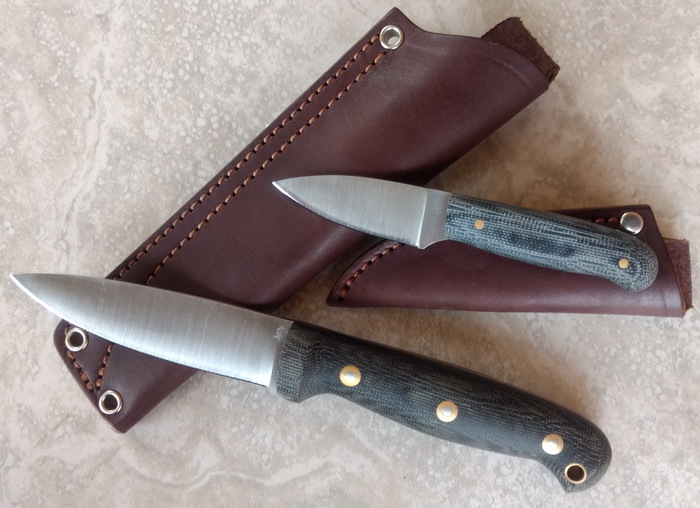 The first knife he made was a kit knife that he put together for his father as a Christmas present. L.T.’s father took the knife to work to show his friends and came home with orders for more knives. L.T. used the money from those knives to buy his first grinder, which he still uses today. He bought the grinder from a knife maker named R.W. Wilson, who had built it. He met R.W. at a gun and knife show. R.W was soon teaching L.T. how to make knives. He taught L.T. not only how to make knives, but also how to sell them. L.T. began taking his knives to shows and used his earnings to buy better machines and additional materials. He eventually decided to take the leap and quit his full-time job at a stair shop to make knives for a living. He built his own web site, participated on forums, and went to knife shows. This helped him build up a loyal customer base. All knife designs or changes in steel are tested before being added to our selection. The knives will be passed around the Pout House (our members’ only private forum) and we evaluate the feedback. Only knives and steels that excel at each task will be put into production. Over the years, L.T. has put together a talented team of knife makers. L.T. oversees their work and takes pride in training each new team member. He enjoys assisting them as they progress in their knife making abilities. Their talent and dedication is integral to the success of the business. They take pride not only in their job, but also the end product. L.T.’s goal is for his crew to become better knife makers than he is. This is not just a job, it is a lifestyle. Here at L.T. Wright Knives, we pride ourselves on our customer service. Phone calls, emails, and messages over social media are always answered in a timely manner. We stand by our products with our lifetime guarantee. These knives are meant to be used for generations and we plan to continue making high quality, hand-crafted knives right here in the United States of America for years to come.